French property for sale, French leasebacks, French investment property. Full Description: The Domaine d'Eilen lies just 900m from the sea and the magnificent bay of Cavalaire-sur-mer, in a luxury residential environment. The domaine has unrestricted views of the regional backdrop, with a southerly exposure, creating an enchanting setting for idyllic holidays. 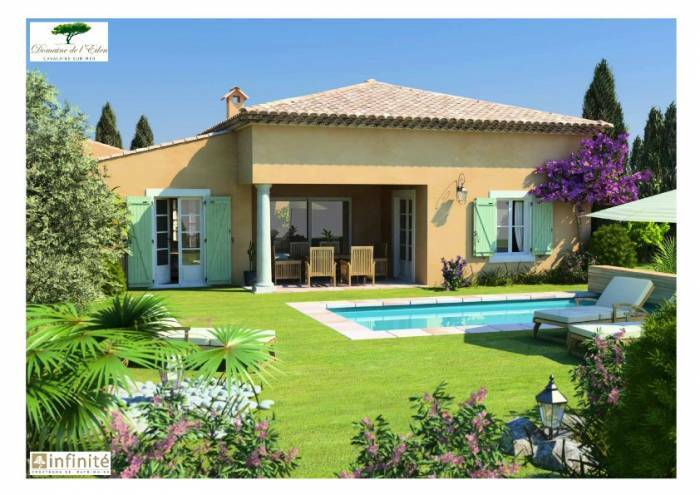 The domaine is totally private, housing 25 luxury villas, each with their own pool. There is secure, 24-hour guarded access to the development. A telephone service provides a range of on-call services - restaurant reservations, tourist trip reservations etc. Gardening and pool maintenance is taken care of, plus the supply of household linen, cleaning and they even deliver croissants, bread and newspapers! Elegance, space and comfort are the key terms in the architecture and furnishing of each villa. Their content is designed for relaxation and privacy for the occupants, while the landscaping of each villa pays particular attention to details such as patios, fountains, aged Provençal-style tiles, Mediterranean trees and plants and lush landscaping. Inside the villas, the developers have opted for maximum comfort - all villas are equipped with large US-style fridges, vitroceramic hobs, microwave ovens, traditional ovens, dishwashers, washing machines, tumble dryers, flat screen tvs (with foreign channels), DVD players, stereo units and high speed internet access. The concept is exclusive in the region, with an exceptional level of service offered to the residents. The 11 years and 9 months lease is managed by Topotel, a luxury service provider, with all the guarantees that implies. Topotel became a national operator in 1993 in the market of luxury hotel facilities. They currently manage and advertise 14 hotel residences in France, including several villa residences with private pools. Their effective commercialisation methods have enabled the company to work with all of the leading travel agentcy networks in France and abroad, in addition to having a reservation call centre. From 735,000€ to 868,000€ exc VAT. From 19,130€ to 22,592€ per year exc VAT. PLUS a 'holiday cheque' to use against the rent at your villa for a value of between 4,619€ and 5,455€ exc VAT. Or you can opt for an investment package where you take the holiday cheque equivalent in cash as rental income. Delivery is in two equal stages - the first is 15 December 2008 and the second is 1st April 2009. Email me now for more details, including up-to-date availability. Nestled in a magnificent bay, Cavalaire-sur-mer is ideally located at the entrance to the Gulf of Saint-Tropez between Lavandou and Sainte-Maxime. Cosily positioned between the Massif des Maures and the Mediterranean Sea, the seaside setting benefits froim an idyllic environment, a hearty invitation to good living and lazy days, in addition to exploring the numerous unique diving sites, the boat rides in the Iles d'Or and many sports and cultural activities. Shopping lovers and night owls will be spoilt with the nearby towns, such as the renowned Saint-Tropez. Short Description: A superbe high quality residence of just 25 three-bed villas, all with their own private pool. Located just south of St Tropez. Secure, gated and 24-hour manned residence, with luxury services, such as restaurant and tourist trip reservations and also bread, croissant and newspaper delivery! High quality fixtures and fittings including top of the range kitchens and satellite tv. Occupation package available.